I regularly hear people say but I already have MailChimp why would I need action Actionetics? The thing is Actionectics is so much more than an autoresponder. Sure you can do the same things as you can with many email autoresponders such as MailChimp, AWeber or Active campaign. But it’s so much more than that. What Actionetics actually does is bring together the convenience and power of an autoresponder for email but also allows advanced automations and sequences which are referred to as action funnels. When combined with your Clickfunnels Sales Funnel they provide a one-two knockout combo to allow you to build an automated sales machine without technical skills or coding. These action funnel sequences can contain things such as emails, SMS messages or other actions. What do I mean by “other actions”? Let’s say somebody joins your email list. They may have opted in on a landing page given you their email address in exchange for some sort of free download. This is one of the standard ways that many websites or sales funnels use to first interact with visitors. Ultimately if you have a business it is highly unlikely that you want the relationship with that visitor to end at that point. You most likely have a product or service you wish to sell to that person or maybe even an affiliate offer you intend to refer them to. This is where Actionetics really comes into its own. By guiding your visitors through one of your action funnels you can segment them based on certain interactions and behaviours. Let’s say the person who initially gets a free download of some kind but then goes on to make a purchase from your business. You don’t want to send them an email sequence requesting and pitching the very products that they have just bought. So as part of an action funnel, you want to move them from that initial option email sequence to a new sequence which may include things like a digital file of some kind if that’s what they have purchased, perhaps a thank you email explaining the details of the purchase or a receipt or an additional offer or invitation to attend a webinar or event. Maybe even access to your exclusive membership content or course create and hosted in a Clickfunnels membership area. Regardless of what you want to send them being able to divide visitors, leads and buyers based on their interactions with your sales funnel is a powerful asset. Many people have the impression or opinion that websites and sales funnels are impersonal and generic. While this may be true of some traditional websites and email marketing tools combining Clickfunnels with Actionetics allows you to tailor the sequences and interactions to such an extent that the experience of the visitor can seem quite personal and customised. And the best part, this can all be done on an automated basis with action funnels. I don’t know about you but having worked in sales across many industries I have found that tailoring to the customer’s needs always makes it easier to close the sale. If you are running online marketing such as Facebook ads, Google ads or other advertising you undoubtedly want the best return on your marketing budget. It’s funny how people put together a basic sales funnel or website. They spend hours or days tweaking small elements such as colors and the position of buttons or images. Now don’t get me wrong the visual experience and layout of your sales funnel is extremely important. However, if you’re using Clickfunnels this is already largely taken care of by using the guides and templates provided with your account. If you listen to those who are most successful in any business space, particularly those who sell heavily online you will have heard the phrase the money is in the list. This is very true and yet for many people, the process that occurs after the initial interaction with the visitor is generally ignored and often makes for a poor user experience and low conversion metrics. You are happy (or at least see the benefit) to spend large amounts of your budget attracting new visitors to the front of your sales funnel. Many people then say they cannot afford to spend on tools to manage and follow up with their email list. This is completely counterproductive and I am here to tell you that you cannot afford not too. You may have heard the saying “it costs 5 times as much money to attract a new customer then it does to keep existing one”. So what does that tell you? Let’s examine that again. If you spend hundreds or even thousands on ads and marketing why would you not allocate some of that budget to a highly powerful sales tool that allows you to make more money from fewer people? When you initially map out your sales funnel you put a lot of thought into the process. Which page comes first? How does the visitor progress from the initial landing page to a free opt-in or maybe even a purchase? This same process should be carefully considered and applied to your action funnel. We also refer to these as back-end funnels. Instead of putting together a few emails just for the sake of it, think about how the visitor will experience the interaction. This could be a combination of the emails, the sales funnel pages and any other external resources you refer them to. Think of your email sequences or action funnels as an automated sales and customer service team. If you structure them correctly they will guide your potential customers through a process of pre-sales or even sales without any direct input from you and your team. Take a moment to consider how much that is actually worth. Sure you have to put in the time initially to carefully plan out the structure of your action funnels and of course create the content but there are few other actions that you could take in your business once that would continue to return additional sales and revenue again and again and again. So with that in mind having a powerful suite of tools such as the combination of Clickfunnels and Actionetics suddenly becomes an incredibly valuable and convenient way to achieve so much. Now I’m sure someone will tell you that there are other ways you can do this and there are! They may even tell you there are cheaper ways to do this. While this statement may technically be correct there is also the practicalities of reality to consider. If you want to go and find cheap web hosting and put together a WordPress website for example and combine it with some sort of page building tool, add several plugins and then go and find an autoresponder which hopefully has some of the features of Actionetics has then that’s great and I hope it works for you. Just remember to do this you will need to learn how to use WordPress, hosting accounts, integrations and the bunch of other skills and platforms. Even with these skills, often using multiple tools together can create conflicts and errors leading to lost sales and eating into your time. So ask yourself is it really worth all of the additional time and management to potentially save money? And I do say potentially since all of these tools must be paid for. Or you can simply grab a full suite Clickfunnels account which includes Actionetics and you can be up and running fast. If you want even more and want to accelerate your learning curve you can sign up for Funnel Builder Secrets which combines the power of Clickfunnels with amazing training to teach you everything you need to know. There are even additional fast-track options. A common complaint often repeated is “I don’t know what to write in my emails?” or “how do I structure an action funnel”. Well, Clickfunnels has solved that problem too. 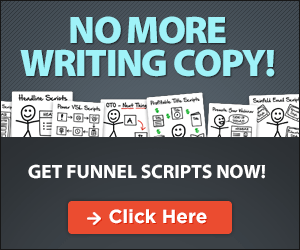 Check out my guide on Funnel scripts which is a super useful copy and script writing tool which allows you to write sales videos, email content, webinars and ad copy like a pro fast. Even if you are a seasoned copywriter you will find it useful. So there you have it, no more excuses like “I’m not technical”. You don’t need to be. “I don’t know which tool to choose”. At this point as you probably guessed the answer is Actionetics and Clickfunnels. Inside you will get the tools and the training you need to build your front-end sales funnels and you’re back in funnels for a comprehensive end-to-end experience for your visitors and customers alike. If you would like to take a more detailed look at some of the things you can do with Actionetics go grab a free 14 day trial of Clickfunnels here to try it out.